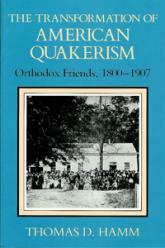 In 1800 American Quakers lived in a unique religious environment, characterized by quietism and the plain life. By 1900 the religious sect had become virtually indistinguishable from the Protestant mainstream, absorbed by the same questions of modernism that troubled other denominations. Thomas Hamm's detailed historical study sheds new light on this transformation, filling a major gap in the literature of American Quakerism and American religion as a whole.